President Yahya Jammeh of Gambia is seeking a fifth term in office after ruling for 22 years. The AFP reports that Jammeh seized power in a 1994 coup and has maintained it ever since with a mixture of severity, mysticism and iron-clad self-belief. “No matter what people say about me, I am not moved… I don’t listen to anybody because I know what is important,” he said while depositing his candidacy for this week’s presidential election. “I will deliver to the Gambian people; and if I have to rule this country for one billion years, I will, if Allah says so,” Jammeh said. 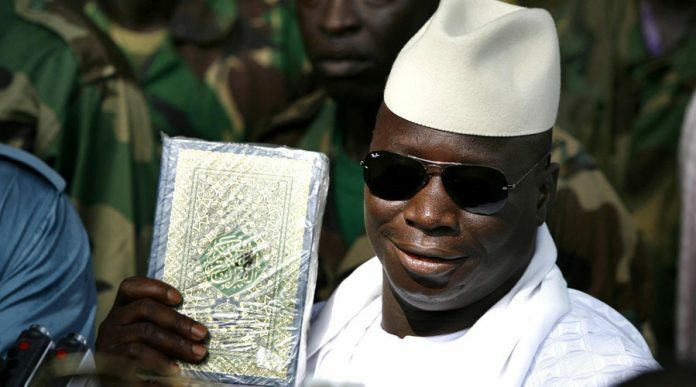 A deeply devout Muslim, Jammeh, 51, and husband of four wives, grew up in the western village of Kanilai in 1965, the year that The Gambia, a long east-west sliver of land bordered by Senegal, gained independence from Britain. But in another moment, he urged his supporters to restrain themselves from violence and allow Thursday’s election to go ahead peacefully. Jammeh controls several businesses in the country and has in the past seized them without warning, discouraging foreign investment. The state of the economy has pushed many young Gambians to take the “Back Way”, or migrant route across the Sahara to Libya, where they board boats bound for Italy.